For me, there is nothing more adorable than a cute little girl in a classic jumper. Add a fox or a squirrel to that jumper and toss in some sweater tights, a peter pan collar and mary janes and you've got yourself a major cuteness overload. I got the idea to make these jumpers for Ruby because she is really into animals right now and I knew that nothing would get her more excited than to have a fox pouncing across her body or a squirrel eating a nut on her belly. The pattern for this jumper is pretty easy to create, just make sure you've got the measurements correct before you get started. I measured Ruby about a month before I made the jumpers, and now they are a bit too small in the chest. Probably better to add a half inch to all of your measurements to ensure they will fit your child for a whole season. I have said it many times before and I will say it again, do not be intimidated by this sewing project! I only know how to make a straight stitch on a sewing machine and if I can do it, so can you! 1. Use a jumper that fits your child to trace a pattern or take measurements of your childs neck line, neckline to below the knee, shoulder to below the knee and chest width to create a pattern. Draw out one half of the jumper on paper and cut it out. Fold the corduroy in half and trace around the jumper pattern. Repeat this twice on the corduroy and twice on the cotton. You should have four panels total when finished tracing and cutting. 2. 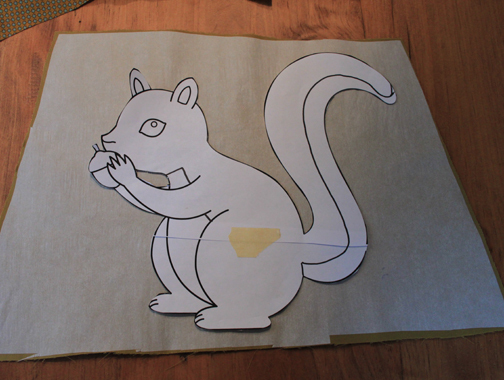 Use a cartoon line drawing of an animal to applique the jumper. You can download this squirrel clip art from the Sweet Clip Art Website here. Or you can download the fox drawing I made here. Print it out and cut it out. I chose to print it kind of large and printed on two pieces of letter sized paper and then taped them together. Iron a piece of fusible webbing and the fabric you want to use as the base of your animal together. 3. Trace the animal onto the fusible webbing backing with a permanent marker and cut it out. 4. Iron a piece of fusible webbing and the accent fabric for your animal together. Cut out the accent shapes of the animal and trace them onto the fusible webbing backing. Cut out the shapes. Iron the shapes onto the animal. 5. Place the animal along the edge of the jumper and cut in half. Now take the backing off the fusible webbing off and place the animal onto the two jumper panels, leaving 1/2 inch seam allowance. Iron the animal onto the jumper. 6. Use DMC pearl cotton embroidery floss to stitch the edges of the animal to the corduroy. Optional: Embroider eyes, nose, whiskers, etc. 7. Cut a slit on the back panels of the jumper. 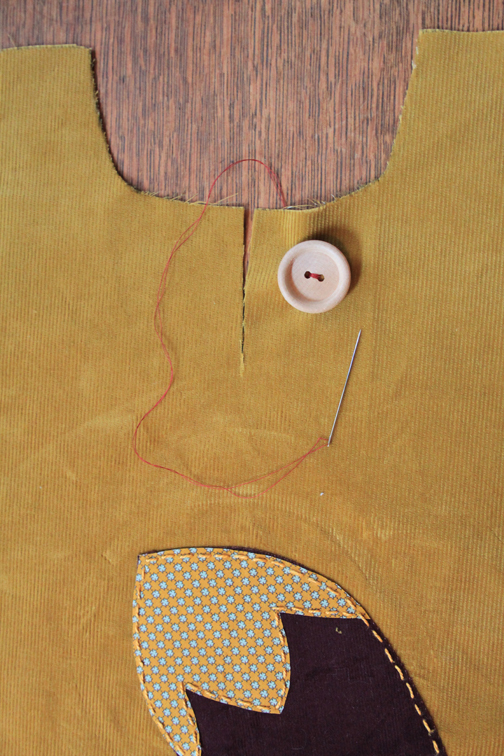 Sew a large button on one side of the slit. 8. First sew the front panel together. Sandwich the lining cotton and corduroy face to face and pin along the bottom, arm and neck holes. Sew the bottom, arm and neck holes together. Turn right side out and press the seams with an iron. 9. Repeat the same process on the back panel. Sandwich the panels together, face to face and pin. Pin the the fabric together around the slit and insert a ribbon or rope cord loop with the loop facing in and the ends facing out. Sew the loop between the two fabrics. Sew the slit, bottom, arm and neck holes. Turn right side out and press the seams with an iron. 10. Sandwich the two panels of the jumper together, face to face. Pin the sides and tops of the straps. Sew the the sides and top straps together. Turn right side out and press the seams.